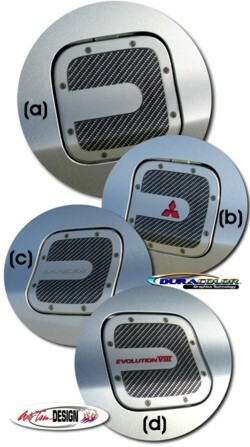 Enhance your '02-'06 Mitsubishi EVO VIII or IX's fuel door by adding this awesome "easy-to-install" decal. Manufactured with a Simulated Carbon Fiber and Silver Metallic composite look, this three dimensional looking decal looks like the door is fastened on with Stainless Steel Hex Head style fasteners! Choose from one of four (4) unique designs shown in the image. This fuel door decal will only fit Evolution VIII or IX model Lancers.